The Labrary, a student-designed pop-up space, explores what libraries of the future might look like. Pop-up spaces are short-term homes for sales, exhibits, and other public uses. Ever get the urge to print a few words on a graham cracker, with chocolate? No? Well, you only have until Dec. 21 to sample that creation, along with some other experiences you may not have imagined. Like petting a sage plant, or hanging out in an inflatable Mylar hut. That’s the last day the Labrary will be open at 92 Mt. Auburn St. The student-designed pop-up space, which is open Mondays through Saturdays from 11 a.m. to 7 p.m., explores what libraries of the future might look like. Pop-up spaces are short-term homes for sales, exhibits, and other public uses. From start to finish, the Labrary will have lasted five weeks. “This whole thing has been a sprint,” said Jeff Goldenson, a Graduate School of Design (GSD) co-instructor in the advanced seminar ADV-09125, or the Library Test Kitchen, where the Labrary projects originated. The other instructors are Jeffrey Schnapp and Ann Whiteside, with help from teaching fellows Ben Brady, M.Arch.1 ’12, and Jessica Yurkofsky, MUP ’12. Teaching fellow Ben Brady, M.Arch.1 ’12 (center), discusses the Labrary with the GDS’s course co-instructor Jeff Goldenson (right) and teaching fellow Jessica Jessica Yurkofsky, MUP ’12. Some student-made fast prototypes seem whimsical. Rola Idris and Pablo Roquero came up with the printing-on-food idea. Their “graham grams,” made on a palm-size platen press, are part of “Millebooks,” a project that illustrates the impermanence of knowledge. (Goldenson said that burned CDs have a life span of seven years.) Next to the little press is a corn tortilla, covered with lines of inked type. Dana Thomson, M.Sc. ’11, a research associate at Harvard Medical School, used her background in global public health to offer the idea of “massive open online scientific literature,” or MOOSL, as an accompaniment to MOOCs, the massive open online courses that are shaking up online education. “It’s the science platform of the future,” she said, a step beyond science literature that has been digital for years, but that can now add depth through multimedia and interactive platforms. Brady lay down on a curving plywood stage, hid his face under a laptop, and pressed a button. Voilà! The image of his figure, splayed over a crime scene outline, was downloaded to Tumblr and flashed onto a big screen. Meet “Bookface,” a “participatory photo opera” created by Nicolas Rivard. It’s a way to consider “what we sacrifice by living digital,” he wrote. Study habits of the future — and the libraries that enable them — may well include more noise than is tolerated now. 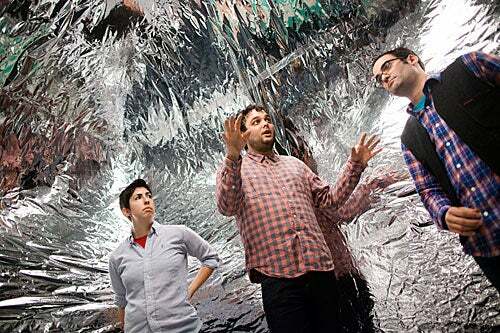 Brady designed a silvery Mylar tent that is kept inflated with a fan. Goldenson looked around at the furnishings: a rug, a lamp, and two beanbag chairs. “It’s been a great meeting space,” he said. Local artist and designer Jim Kalambokis sampled a little of that serendipity. He is creative director at the Fullbridge Program in Harvard Square, and “stumbled on the Labrary while grabbing lunch one day.” He was charmed, and set up a display of his book art. Goldenson likes the idea of a library space that is less isolated than tradition requires, that encourages collaboration, and that puts student work on public display. “We’re trying to make an argument for a public space for the library,” he said. That includes letting students use it for their own needs, including the study break part that Qian organized. An upcoming lecture, “Library as Platform,” will be held at the Labrary from noon to 1 p.m. on Dec. 14. Charles Warren Professor of American History James Kloppenberg addressed the 114 students who were being recognized at the 2012-13 Midyear Graduates Recognition Ceremony in the Radcliffe Gymnasium.